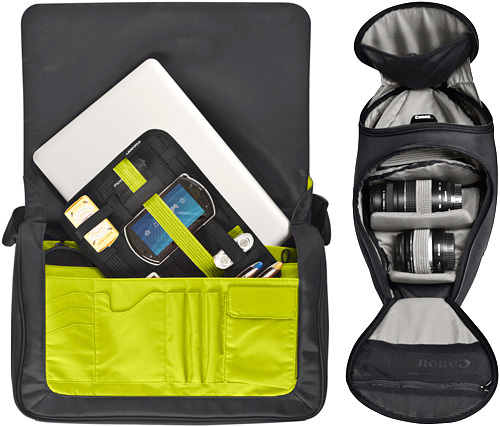 Hands-On With The Cocoon Soho Messenger Bag And Tribeca Digital SLR Sling | OhGizmo! Hello everyone. My name is Andrew Liszewski, and I’m an organizationaholic. It’s been 3 days since I last re-sorted my sock drawer, 2 weeks since I re-organized the app icons on my iPhone, and I have a closet full of backpacks and messenger bags that represent an ongoing hunt for the perfect way to stay organized on the go. 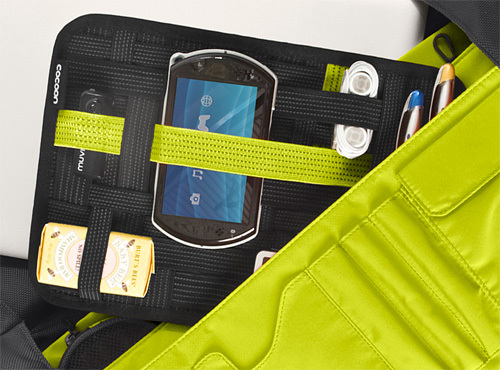 Now I may never find that perfect bag, but companies like Cocoon Technologies give me hope that it might one day exist. I first stumbled across the company at CES last year, and their claim to fame was a unique organizational system known as ‘The Grid’ which used a series of criss-crossing elastic straps to secure an almost infinite variety of gear and accessories. So when I visited the company’s booth at CES back in January I was pleasantly surprised to find they had expanded their line of bags, cases and backpacks considerably over the past year, and I recently had a chance to try out two of their new offerings, the Soho Messenger bag and the Tribeca DSLR Sling. From what I’ve seen the company is definitely on the right track, and in just a short amount of time they’ve already positioned themselves to be a worthy competitor to other bag makers like WaterField Designs, Crumpler and Tom Bihn. You can find my hands-on look at both bags after the jump. For people who don’t consider a purse to be an option, the messenger bag is the next best thing when you leave the house. It’s not only the perfect way to carry a bunch of crap without having unsightly bulging pockets, but it also provides a convenient place to stash things you buy, since where I live at least, a plastic bag will set you back 5 cents. And I personally like a bag that’s also designed to safely carry a laptop when needed, without a protective sleeve of some sort, even if it’s only once in a blue moon. I had a chance to check out the 16-inch version of Cocoon’s Soho Messenger bag which is designed to carry those monstrous widescreen portable computers that have easily outgrown the term ‘laptop’. I definitely prefer the smaller version which is designed for 13-inch laptops and smaller netbooks, but if you have the need to carry a larger version, this will easily accommodate it. The exterior finish of the Soho is very clean, which I always like, with a large flap that’s held in place by a magnet in each corner so you won’t have to worry about trying to muffle the sound of tearing velcro if you’re in a crowded public place. And the adjustable strap is made from what appears to be seatbelt material, so you can safely assume it’s going to be extremely durable. The Soho is available in 3 different color schemes, red & brown, gray & orange and black & green, which is the version I was sent, and is the version I definitely prefer. I will never buy a bag again that doesn’t have a brightly colored interior since it makes finding things so much easier. And the bright day-glow green interior of this bag definitely provides adequate contrast to the black charging and USB cables you might have to bring with you. 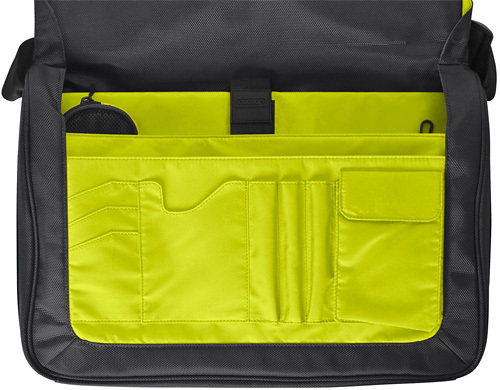 The inside of the bag has several slots and pockets designed for holding whatever you see fit: documents, magazines, iPads etc. but the rear-most slot is specifically designed for a laptop since it’s padded and features a velcro strap to prevent it from sliding out. Speaking to the company at CES they expressed their extreme dislike for velcro which I wholeheartedly agree with, but I can understand why they’ve used it here since you’d need a pretty strong magnet on the strap to secure a heavy laptop, and there’s always the risk of mixing electronics and magnets. On the front-most slot there’s also a series of smaller pockets, just on the inside of the bag, that can be used for holding pens, phones, hard drives, business cards or whatever, and tucked away in the back is a small hook for holding your keys if you don’t want them floating around in your pocket. Of course the Soho Messenger bag also comes with one of the company’s elastic strap GRID-IT panels that makes it easy to secure all those random bits of electronics so they’re not floating around the inside of your bag or getting misplaced. 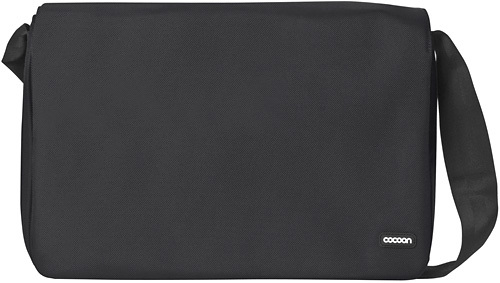 I can understand why Cocoon chooses to include their GRID-IT design on these removable panels, since the stiff backing allows the elastic strips stay stretched which helps them secure items more effectively, and it’s also a lot easier to add and remove things when the entire panel can be removed. But in the future I’d maybe like to see more of these elastic straps integrated into the bag, since they prevent items from moving around and banging into each other. When it comes to camera bags, the one thing I look for, besides a bag that will adequately protect my body and lenses, is the ability to carry other crap as well. I may be heading out with the intention of doing a little shooting, but that doesn’t mean I won’t still have my phone and other gear with me as well. 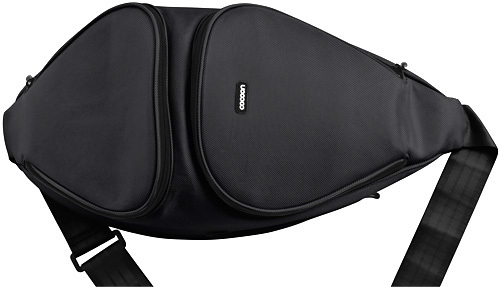 So besides the two large pockets on top designed to store a couple of lenses and your camera body, Cocoon’s Tribeca DSLR Sling also has a couple of slots on either side that can be used to hold phones, keys, your wallet and of course your MP3 player. In fact one of the slots even has a headphone hole so you can listen to your music or take calls while your MP3 player or phone is stashed inside. They’re not enormous though, you won’t be carrying a water bottle or a netbook or anything like that, but they’re adequate enough to free up space in your pockets. And like the Soho messenger bag, the Tribeca Sling has an adjustable strap that’s made from seatbelt material, and the outside is just as clean and simple. The sling design also makes it easier to access your camera or lenses without having to take it off, since you can spin it around to the front of your body and open the various pockets without having to be a contortionist. But unlike the Soho, the Tribeca Sling comes in 5 different color schemes including gray & orange, black & green, red & brown, tan & pink and black & gray which is the version I tried. Again, I would probably opt for the brighter orange or green interiors if I was ordering one of the cases, but all of the color schemes look pretty slick, and it would be a touch decision to make. 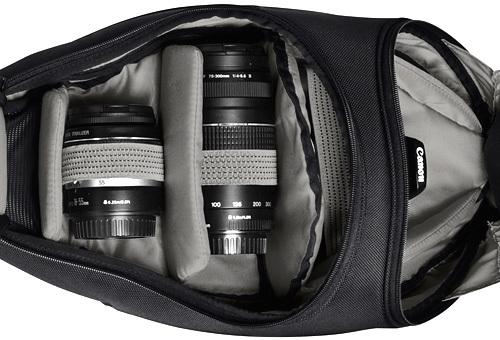 Now one of the complaints I had with the Soho bag was that it didn’t really integrate any of the elastic straps that make the company’s GRID-IT system so unique, but they have been used in the Tribeca to easily secure your lenses. One thing I have to mention though is that the sling probably won’t be able to accommodate your DSLR with most lenses attached. While I did manage to get the zippered panel closed with an 18-70mm lens attached to my Nikon, it was a tight fit. You’ll probably have better luck with a shorter prime lens, but for the most part I would accept the fact that you’ll only be able to squeeze your camera body inside without a lens attached. Not a huge issue, but it means you won’t be able to just whip out your camera and start shooting right away. The inside of each unzippable flap on the Tribeca also have mesh pockets for storing memory cards, filters and other camera accessories, but I wouldn’t consider it a heavy-duty camera bag since there’s no way to secure a monopod or even carry something like a flash. It’s definitely more of a camera day bag, but I’d still recommend it as an alternative to a backpack or shoulder bag if you were planning on doing some casual shooting. If you were heading to the Serengeti to shoot a National Geographic spread, probably not. Now I know that some people might scoff at the idea of paying $80 for a messenger bag, or $100 for a camera bag, but when you think about it, when all packed they’re usually touting thousands of dollars worth of gear, so in the long run it’s actually not a bad investment. And so far, having gone over both bags with a fine-toothed comb, I have to say I’m quite pleased with the build quality of Cocoon’s offerings. There’s nary a loose thread or out of line stitch to be found, and I’m confident they’re the type of bag that will not start falling apart after a year’s use. In a crowded market the company’s GRID-IT storage system has allowed Cocoon to stand out and make a name for themselves, and while I’ve already mentioned that I’d be excited to see it integrated into some of their bags a little more, besides just including a GRID-IT panel, in its current form it’s still a dream come true for highly organized types like myself. I'd never thought about it before, but a bright interior would make things easier to find. They really thought this one through, what a great bag.